If you've ever wondered exactly how Cold Processed, or CP, soap is made, look no further! Here is my process, start to finish. Today I made my Raw Honey & Beeswax Soap. A few months ago I melted down all the leftover wax from my hives and ended up with some beautiful golden wax, which I then molded into bars. This was the inspiration for my entire soap making journey, and this particular soap recipe was where it all began. As with cooking, mise en place -- I measure out all of my ingredients before I begin. This eliminates having to adjust my recipe because I ran out of an ingredient. Not that that's ever happened... I measure my Sodium Hydroxide, commonly known as lye, and add it to my water. That mixture gets hot, quickly, and needs time to cool to a manageable temperature. While it is cooling, I prepare my oils. This recipe uses a mixture of organic and non-GMO liquid oils (olive oil, avocado oil, and sunflower oil), and organic hard oils and butters (cocoa butter, coconut oil). And of course I measure out a good amount of honey and beeswax! I melt my wax and other hard ingredients in a double boiler. Some people use the microwave, but after years of tempering chocolate I feel pretty comfortable using this method. I don't use any special equipment, just a stainless steel bowl on top of a small pot of simmering water. Once all of my ingredients are melted and warm, I combine them with my lye-water. At first the mixture is thin, runny, and only slightly less transparent than the oils were in their original state. Soon, though, the oils begin to saponify. This means that the sodium hydroxide breaks apart into sodium molecules and hydrogen molecules, and they combine with the fatty acids in the oil. These newly formed molecules are different types of salts (depending on the oils used). Of course, to us, this salt is soap! You can see this process beginning, because the mixture becomes opaque. It also begins to thicken. We call that "reaching trace". Most oils take a long time to trace, so I often use an immersion blender to speed up the process. But this recipe traces ultra-fast, and I have to move quickly to get it poured before it becomes as thick as pudding. 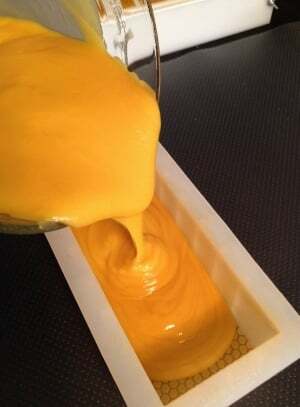 The soap is poured into a mold where it will set up. This can take anywhere from several hours, to many days. Because of the added beeswax, this particular soap sets up fairly quickly. I unmold it after 12 hours, then cut it into bars. This mold makes 7-8 bars at a time, depending on how thick I cut them. The bars are cut, but the soap isn't done yet! The process of saponification takes a minimum of 6 weeks. Some soaps need to cure even longer, up to 6 months or even a year! I'm looking at you castille. During this time, all of the lye gets completely used up -- none remains in the cured soap. The soap will mature and develop it's true characteristics. A soap with a fluffy lather will get more bubbly. A mild, gentle bar will get more mild. A hard bar will firm up more. The process takes time, but the end results are definitely worth the wait.